Breakfast is better in Mexico. Oaxacan coffee is good, and they serve cut up papaya, pinapple, mango, apple, banana with homemade granola and yogurt . . . usually for about 2 dollars. Of course there are "hotcakes" and all sorts of Huevos, but the fruit usually made me happiest. 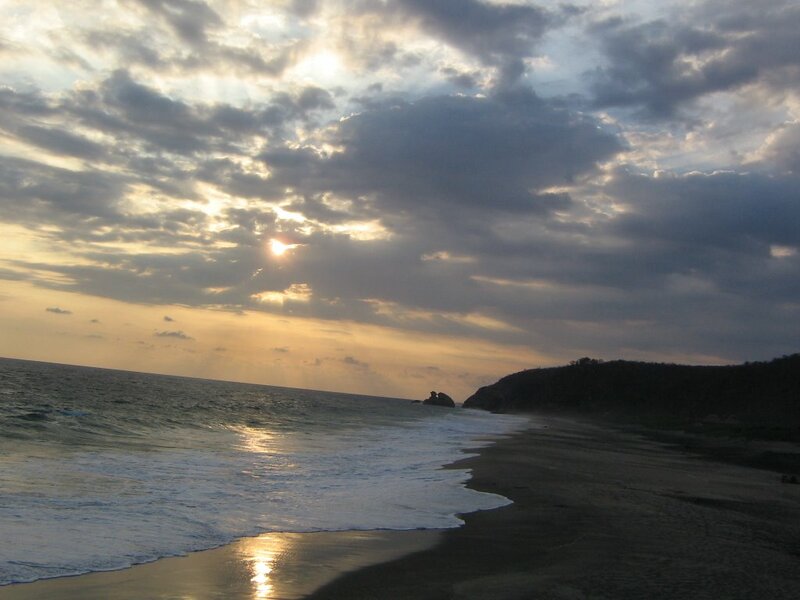 Zipolite and Mazunte are too hot in April. Though they are good inexpensive vacation spots, its hard to sleep there now. Probably perfect in February. Solstice, in Zipolite, has a fantastic Yoga teacher named Brigitte. She uses all kinds of props to align you, and give clear Spanish and English directions in her cute Dutch accent. I left feeling an inch taller. If staying in Mazunte, I recommend Alta Mira, privacy and unparalleled views. Also be sure to go to the western beach to see the sunset. Avoid Balamjuyuk, the French couple owners were not very friendly (granted I needed to cancel the 6 day reservation that I reserved). There wasn't much love in the breakfast. suko and I were able to unwind together and actually talk out our future. She has been very lucky for the past few weeks. She got into Hunter for an MFA and yesterday was offered a job as the Visual Arts Curator or Chashama, a non profit arts organization. She also got 2 weeks of undistracted attention from her boy! Our fall will be busy indeed. Next Question is where we will live and for how long we will live there. Appently, my neighbor wants to expand and buy my place. hmmmmm. Anyway, more about mexico, average income is about 6 thousand dollars a year, yet basic staples like gasoline and milk cost the same amount as they do in the states. After driving around with Colin and Carla, I realized there simply isn't the same car infrastructure. In fact, to take the highways, there are unafforable tarrifs. I think it cost over 25 dollars to get from Guadalajara to San miguel de Allende. Will that lead to a more sustainable future? Perhaps. Is there enough water there? Don't know.